Texas’ controversial voter ID bill was struck down again, this time by a three-judge panel in Washington, D.C., that said the bill would disenfranchise certain segments of the voting-age population. Texas’ controversial voter ID bill was struck down again, this time by a three-judge panel in Washington D.C. that determined the bill would disenfranchise certain segments of the voting-age population. The bill, SB 14 sponsored by state Sen. Troy Fraser, R-Horseshoe Bay, requires that citizens furnish a photo ID before casting a ballot, and has been championed by supporters as a necessary tool to stamp out voter fraud in Texas. Opponents argue that the bill would adversely affect voters who don’t have easy access to an ID, something the court agreed with in its ruling. Under Section 5 of the federal Voting Rights Act, the federal government must approve laws passed in states with a history of racial discrimination. Texas Attorney General Greg Abbott said the state will appeal the decision to the U.S. Supreme Court. "The Supreme Court of the United States has already upheld Voter ID laws as a constitutional method of ensuring integrity at the ballot box," he said in a written statement. "Today's decision is wrong on the law and improperly prevents Texas from implementing the same type of ballot integrity safeguards that are employed by Georgia and Indiana - and were upheld by the Supreme Court. The State will appeal this decision to the U.S. Supreme Court, where we are confident we will prevail." Despite Abbott’s pledge to appeal, the district court’s late-summer decision makes it unlikely there will be time to overturn the ruling before the Nov. 6 general election. The high court is not scheduled to reconvene until October. 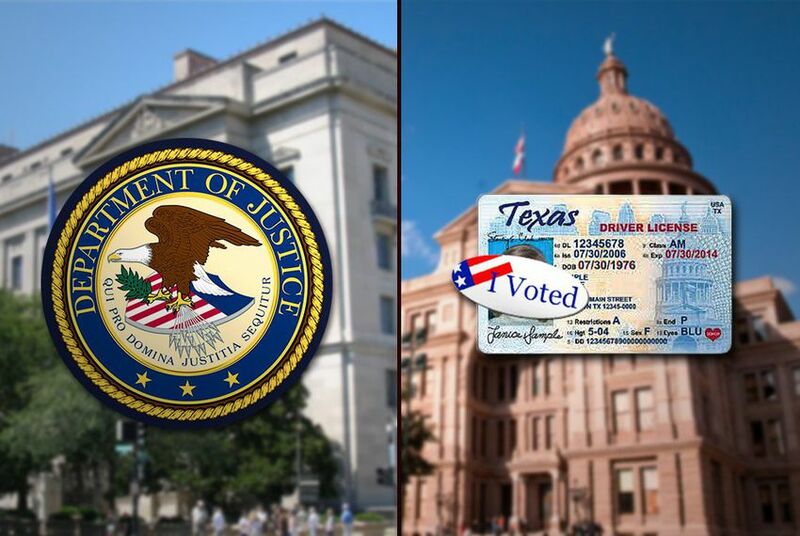 The decision comes after a ruling in March by the U.S. Department of Justice, which rejected Texas' application for preclearance saying the state did not prove that the bill would not have a discriminatory effect on minority voters. Thursday’s decision is a result of a lawsuit filed Abbott filed in January against the Department of Justice after he anticipated denial of preclearance. Abbott sought to have the law implemented immediately and said then that Texas is held to a higher bar than other states with similar laws. The court’s decision is the second time in less than a week that Texas has been affected under Section 5 of the Voting Rights Act. On Tuesday, a court ruled that Texas lawmakers violated the act when they drew new state House, Senate and congressional maps. In Thursday’s ruling, the judges said the state was its own worst enemy. The court added that the case would have been “far closer” if the Legislature passed amendments filed that would have made the law less stringent, including measures that would have waived fees for the indigent who needed documents to obtain an ID to vote, and expanded the range of identifications acceptable under SB 14. Amendments that would have kept DPS offices open in the evening and on weekends, and allowed the indigent residents to cast provisional ballots without photo ID were also voted down or tabled. Democrats were quick to cheer the ruling and assail the GOP for pushing the issue. “Their [Republican] law was a dangerous solution in search of a problem, while real problems like having the highest uninsured population in the nation, schools failing to meet federal requirements, and crumbling state infrastructure still go unresolved,” Houston state Rep. Jessica Farrar, the chairwoman of the House Democratic Caucus, said in a statement. “It's high time for Attorney General Abbott to stop burning our tax dollars on losing lawsuits meant to make it harder for Texans to vote. Instead of waging a partisan crusade against key protections granted by the landmark Voting Rights Act, he should start focusing on the real issues facing Texas." State Sen. Wendy Davis, D-Fort Worth, who faces a tough challenge in November against state Rep. Mark Shelton, R-Fort Worth, said state Republicans missed an opportunity to pass an acceptable bill. The NAACP, the Mexican American Legislative Caucus, the Lawyers’ Committee for Civil Rights Under Law and the Brennan Center for Justice issued a joint statement cheering the decision. U.S. Sen. John Cornyn, R-Texas, said he was disappointed, but said the decision is ultimately up to the country’s high court. “The Supreme Court will have the final say as Texas fights to preserve the integrity of the voting process with a commonsense, constitutional law vital to the health of our democracy,” he said in a statement.